Gary Slaughter was born and raised in Owosso, Michigan. 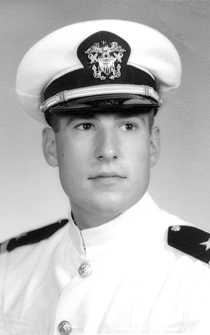 After graduating from the University of Michigan, he served seven years, during the Cold War, as a naval officer primarily on anti-submarine destroyers. Following his distinguishing Navy service, he became an expert on managing corporate information technology. He traveled extensively, lecturing and consulting to clients in the United States and abroad. In 2002, he put his career on hold and began to write the Cottonwood series, five award-winning novels, depicting life on the World War II home front. In Sea Stories, he reveals an incident that occurred on October 27, 1962 during the height of the Cuban Missile Crisis. This incident was the closest that the Soviet Union and the United States ever came to having an exchange of nuclear weapons. However, the incident was classified Top Secret under the terms of an agreement between Premier Khrushchev and President Kennedy that ended the crisis. After 40 years of keeping his secret, even from his family, the event was finally declassified when his story was revealed in Peter Huchthausen's 2002 book, October Fury. Since then, four documentary filmmakers sought his participation in developing a file to celebrate the 50th anniversary of the Cuban Missile Crisis. He selected Bedlam Productions, whose movie, The King's Speech, won the 2010 Best Picture Academy Award. Fittingly, the Bedlam documentary was entitled The Man Who Saved the World. He was also interviewed and filmed for the BBC documentary, The Silent War. After having written and lectured extensively about the Cuban Missile Crisis for a dozen years, the author shares the fascinating details of his entire naval career in 60 vignettes comprising Sea Stories.